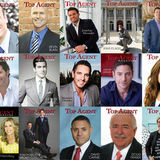 Michael Menin has earned multiple awards, including six straight years as a SEATTLE Magazine Five-Star Professional and Best in Client Satisfaction award, placing him among the Top 7% of real estate agents in Seattle. 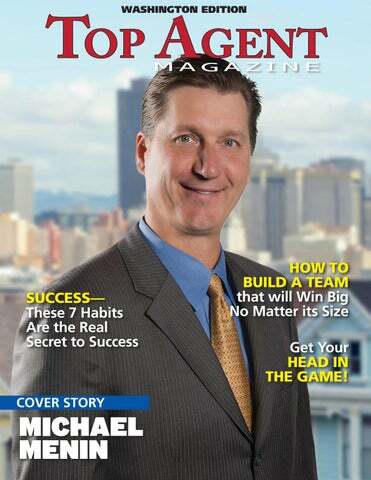 To learn more about Michael Menin, visit michaelmenin.com, email MichaelMenin@Comcast.net or call 425.941.7121 www. stress situations. Luckily, it seems not all of them are simply born with this ability, but have many strategies they use to help them achieve higher emotional intelligence. Here are seven strategies and habits that will help you achieve success in every area of your life. BE COMPOSED The first thing successful people always seem to have under control is their composure. Successful people stay calm and composed when the going gets tough and fingers start pointing. They don’t panic. The secret? They understand that in life things are always changing. It doesn’t matter if something is bad at the moment because that will change soon enough. In this topsy turvy life all you can really do is adapt in order to stay happy and remain in control of how you react. fear asking questions. They fear not asking those questions and growing stagnant. BE DELIBERATE It is important to think and reason before you come to a decision. Successful people don’t rush. They seek out advice from other, they think of all the aspects, and sleep on their thoughts before finally making their decision. Your gut instinct can be misleading, and lead you to make a rash decision that you will come to regret later. BE CERTAIN, AND SPEAK WITH CONVICTION Successful people speak with certainty. Unless you communicate your ideas with conviction and certainty, then you will have a hard time getting people to listen to them. BE POSITIVE Successful people use positive body language when they are talking to other people. Their tone is enthusiastic, they maintain eye contact, leaning in towards the person speaking to show interest. Successful people use it to draw those other people in. How you say something can be just as if not more important that what you say to people. Positive body language can completely alter how your speech is perceived by others, and helps to keep attention on you and what you are saying. BE MEMORABLE BY LEAVING A STRONG FIRST IMPRESSION You only have once to make a first impression, and they are incredibly important, as they are closely ties to positive body language. You have around 7 seconds to convince a person to like you after you initially meet them. That is how long it takes them to decide when they meet you. After that a person is simply spending the rest of the conversation justifying that initial reaction they had. You can make sure you make a good first impression by having strong posture, a firm handshake, a warm smile, and open shoulders. BE FEARLESS Successful people know that to give in to fear is a choice. They donâ&#x20AC;&#x2122;t let the fear take over, instead focusing on the rush of euphoria that comes with conquering fears. All of this adds up to having a high emotional intelligence. What helps you to succeed is the ability to control those whirlwind emotions so you can stay calm and focused on actually succeeding. These habits can help you gain a higher emotional intelligence, but as you probably already know, anything involving dealing with your emotions in a healthy manner takes serious work. So, donâ&#x20AC;&#x2122;t give up if you fail the first time. You must always try and try again. The stories about Ben Hogan, Jack Nicklaus, Billie Jean King, John McEnroe, Kobe Bryant, Michael Jordan, Michael Phelps, Lionel Messi, Amanda Beard, and thousands of other sports greats share many When you hear negative basic success principles. Think of the Captains of Commerce in your business and chances are the success principles are much the same. messages in your mind... take a deep breath and replace them with supportive words. I’ve been privileged to have worked with some of the very best in sport and business over many years and this is some of what I’ve learned from them. 5 ideas for stepping up your game. Preparation is what creates confidence. Don’t work on confidence. Practice more. Whether it’s practicing getting out of the starting blocks quickly in the 100 meter dash, efficient flip turns in the pool, chipping onto the green from 30 yards away or rehearsing business presentation scripts, introducing yourself while knocking on doors, or closing assertively after a strong presentation...you can’t get around practice/preparation. Check out “the 10,000 Hour Rule,” in Gladwell’s, Outliers. Ya gotta do the work! Mental practice in a relaxed state of mind (self-hypnosis) can speed up the success process from 2-5 times. Read almost any autobiography of a successful athlete or business personality and recognize this common trait; almost all successful people saw and savored the end result in their quiet, meditative states first. give today, etc. The result of negative self-talk (self fulfilling prophesy) is obvious...poor posture, unfocused, procrastination, fear. Self sabotage! When you hear negative messages in your mind...take a deep breath and replace them with supportive words. This will get easier and more automatic with practice and so will your successes. (If you don’t achieve what you set out for...it doesn’t matter...keep doing this.) The difference in how the ultimately successful get to where they are and where everyone one else gets, is how soon you pull the plug and quit. Raise your game by staying in it. As you shift your mind your game will improve/your business will improve. Visualize the self-talk. Pictures make more and deeper neurological impressions. A picture IS worth a thousand words. The greats in every sport played the game, walked the course, saw the 100 mph fastball come in, saw the touch at the pool’s wall, broke the beam at the finish line well before their bodies were involved. Your actions are based on your thoughts. Don’t be random. Choose successful pictures that move you forward. Feel the satisfaction of success for just a moment. How would it feel hitting that perfect dive, making the 20 foot putt, running your personal best in a 10k, nailing that listing presentation, passing that test? Allowing the neurotransmitter dopamine to flash through the pleasure centers of your brain, reinforces the positive goal towhich you are moving. We do things to maximize pleasure or to minimize discomfort. As you associate the task or goal with a positive feeling, you’ll approach the task/ goal with a more open, “CAN DO,” attitude. It’s attitude not aptitude that usually matters more. Like a pep talk before a game, like a supportive hand on a child’s shoulder before a test in school, like a smile from a prospect that says, “I’m open to what you have to say,” feel good about what you’re here to do. You’ll make changes, not because you need to or want to, but because it feels good. Take the kicking and screaming out of your life to experience a more centered and focused energy. Relax before you compete/take care of that piece of business. Some use music, some meditate, some create physical rituals (eat a certain food, do push ups, clap hands, stretch, a couple of breathes (and a whole lot of other crazy things you’ve seen. It ain’t crazy if it works.) Create a small ritual that focuses you in the last moment before the event/business presentation/prospecting/public speaking... Some sport psychology is about emotional, social and or physical issues, more to be addressed by qualified coaches, counselors or therapists, trained to deal with psychological baggage and physical scars. Some business leaders sit in with therapists and coaches to sort out individual blocks. But after all the analysis is said and done, the smart ones go back to the basics. See the ball, hit the ball. Copyright©, 2016 Barry Eisen. All rights reserved. So, when creating a team, logic would tell us that the bigger it is, the better, right? Wrong. When it comes to real estate teams, size doesnâ&#x20AC;&#x2122;t matter so much as the players you bring onto that team to work with you. A team doesnâ&#x20AC;&#x2122;t have to be big to win big, and here are the secrets to building a team that wins big no matter its size. You’ve probably heard the saying, “you’re only as strong as you’re weakest link.” That idea holds true for any kind of team, including those in real estate. If you have weak members on your team, then it’s not possible to have a strong team. Drawing strong team members to your business is essential. Finding strong team members is just one part of the equation. As the leader of your team, you now have to assess each member’s strengths and weaknesses and position them appropriately. You want the best player for each role playing that part and catering to their strengths. Choose your team member’s roles wisely, and place each individual in the position where their strengths can shine and they can best contribute to a win for the entire team. Every role is important to the team working smoothly and winning as a whole, so it is important to place each team member in the role most suited to his or her skills. help best utilize each team member and instruct them on how they need to work together to fulfill the recipe that will lead them to be a winning team. Your team members need to know the plan and you must give them the tools to successfully execute it. It is up to the leader of a team to help your players see your vision and help them understand what a victory looks like. The goal may seem simple and obvious to you, but you must communicate it over and over again to your team members, so they understand it as well as you do. With different personalities coming together to form a unit, you are going to be dealing with numerous challenges such as competing agendas. You will find this on any team. You must keep the goal and at the forefront of your playerâ&#x20AC;&#x2122;s minds in order to encourage them to put aside their own personal desires in order to come together as one cohesive, single-minded unit and push towards the teamâ&#x20AC;&#x2122;s goal. Give Your Team Members the Tools to Help Them Perform at Their Best The final thing all great leaders do is equip their team members with the proper tools and training needed for them to succeed. You have to show them how they can each come together with their different strengths to work as a team towards one unified goal. This involves more than simple skills training, but also endurance, so they can last as a team and win even those matches that seem unending and impossible. Think of all the challenges that they could possibly face ahead, and clear their path to victory by giving them the necessary training and tools they will need to get past any obstacle. As the leader, you must be prepared to continually communicate the teamâ&#x20AC;&#x2122;s goal and your vision. Use that vision to motivate your team members throughout the journey towards victory.